Since a longer time we wanted to make a trip together. We figurered out a day in may which was fitting for all of us. Oli and me drove with the car on a friday afternoon to Freiburg to start the next day off Recep’s place. 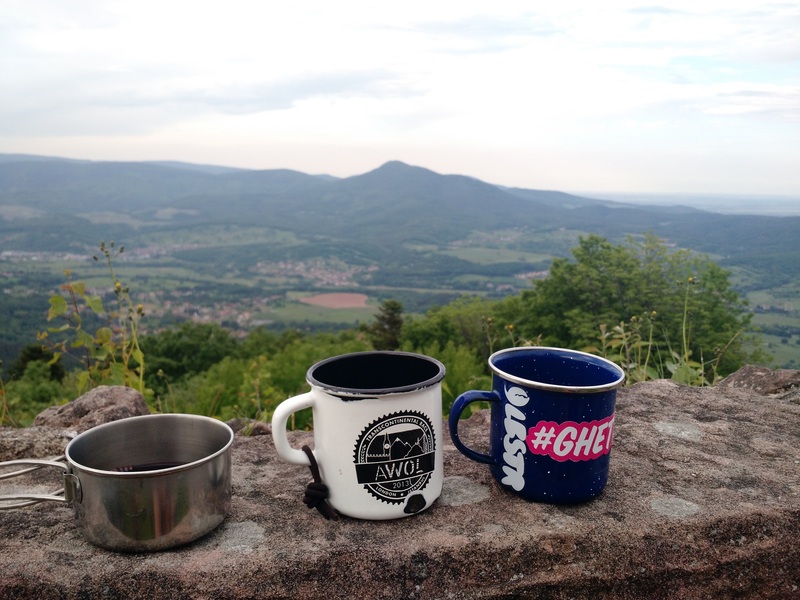 Recep planned a three day adventure to and in the Vosges|France for us. 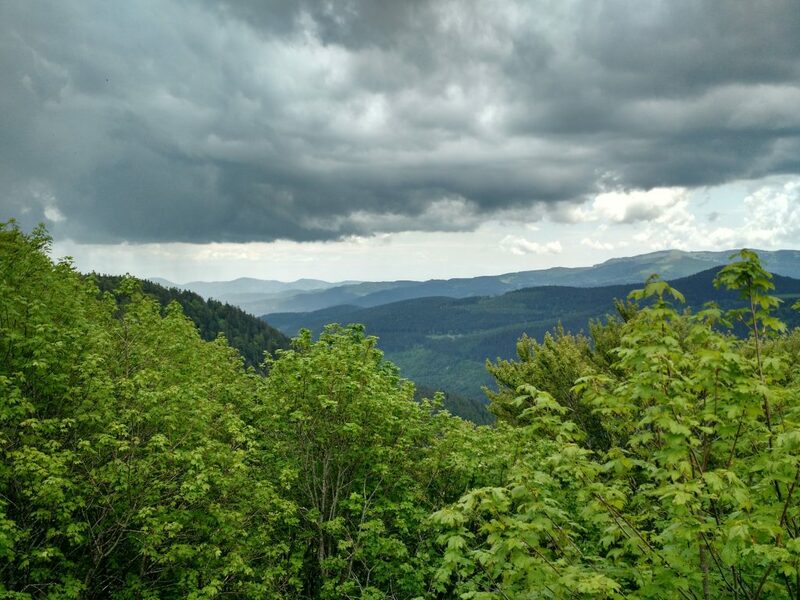 The Vosges are on the opposite of the Black Forest on which bottom Freiburg is located. The night be talked about the trip and possible sleeping spots. If you travel with Recep you have to start the day with a ‘BUM’ (vodka with some chemics). 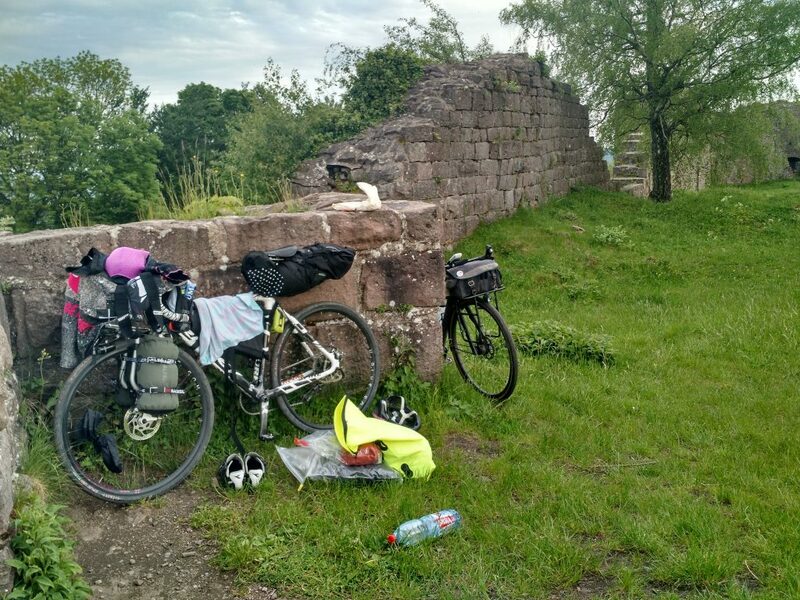 First brake on the french side of the Rhine. Get some food! Still on bikelanes with a solid ground. 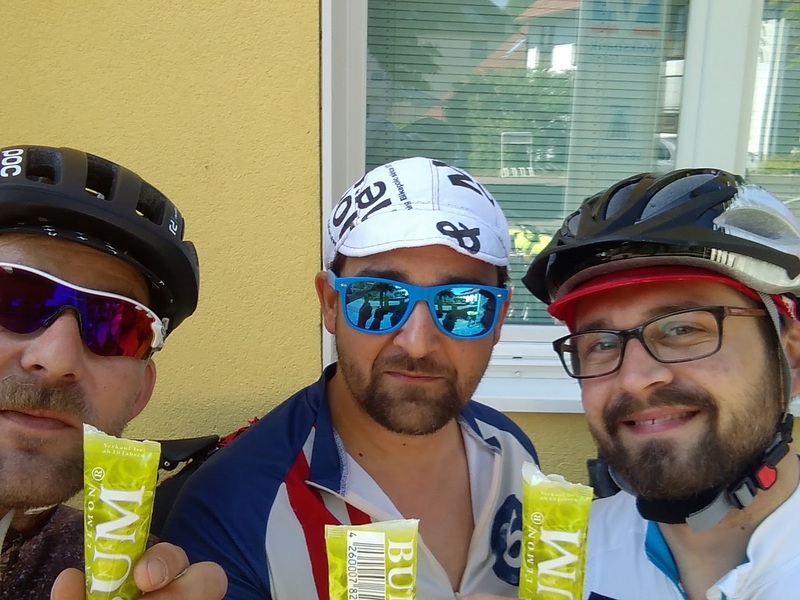 Short before it started to get hilly we stopped in Schlettstadt at a supermarket to buy the essentials. Meat, wine and baguette. Now we were prepared for the climb. The ground got more gravel style and steeper. The last 2k’s till our goal got more worse. The rocks on the ground got bigger and our energy less. Top combination! 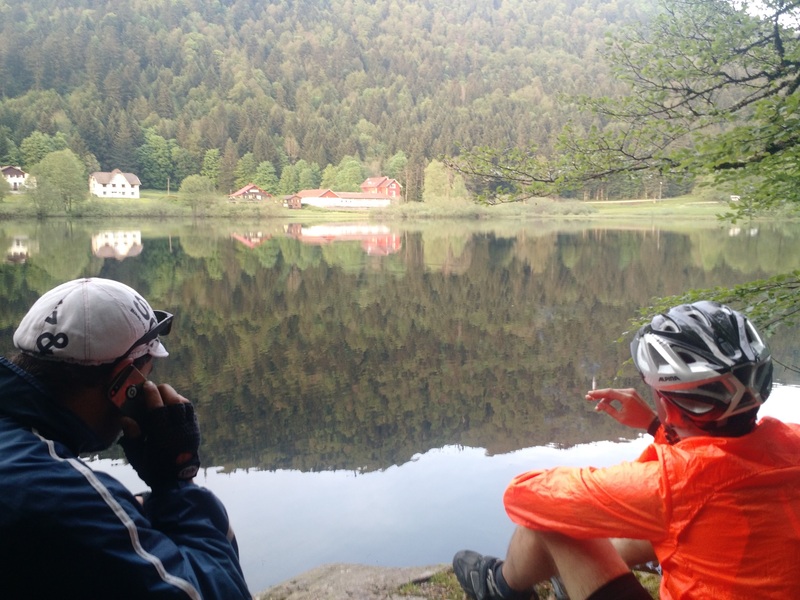 The second day started after a coffee with a view with a nicely downhill section. 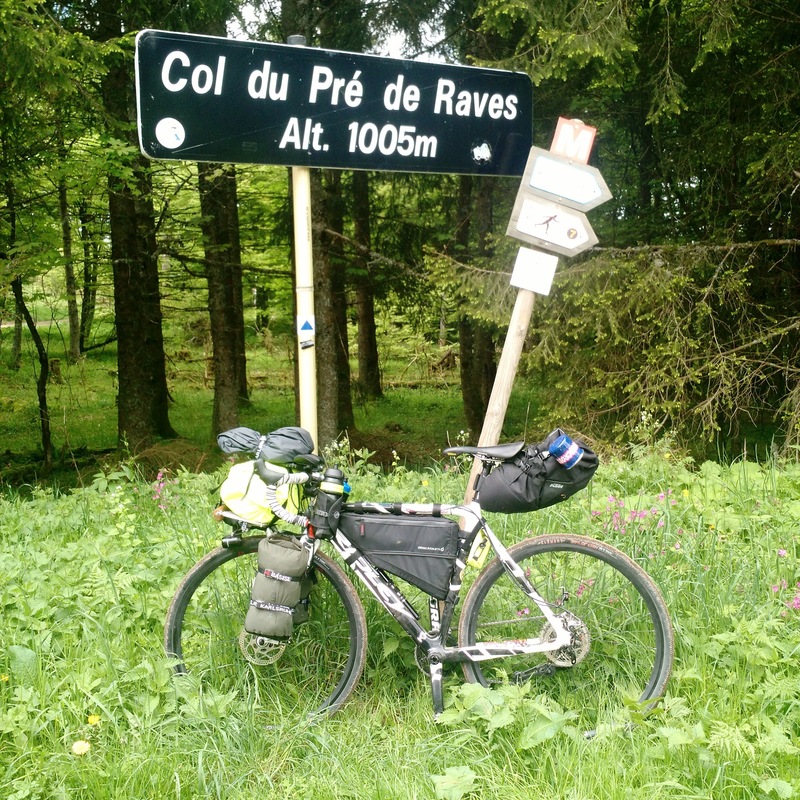 For a while the same (MTB) way we climbed the day before. 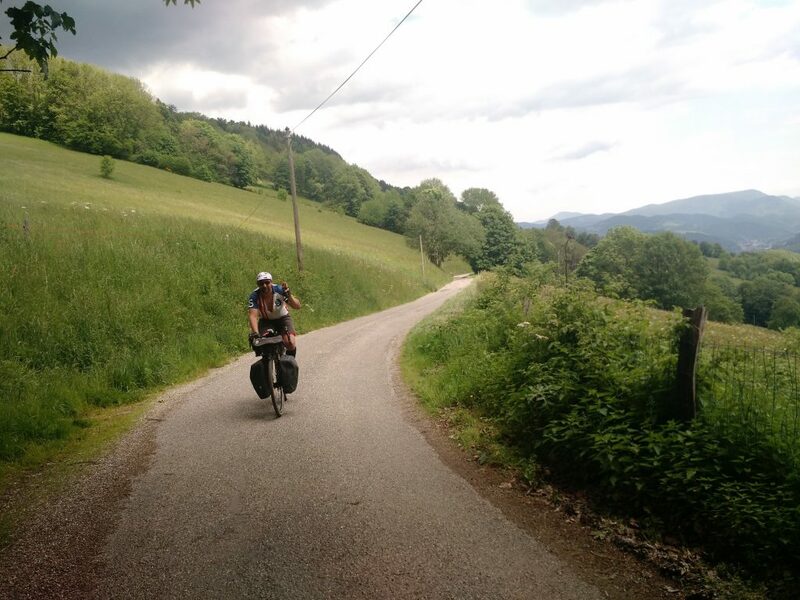 Then we followed the valley, direction the massive of the Vosges – les Ballon. 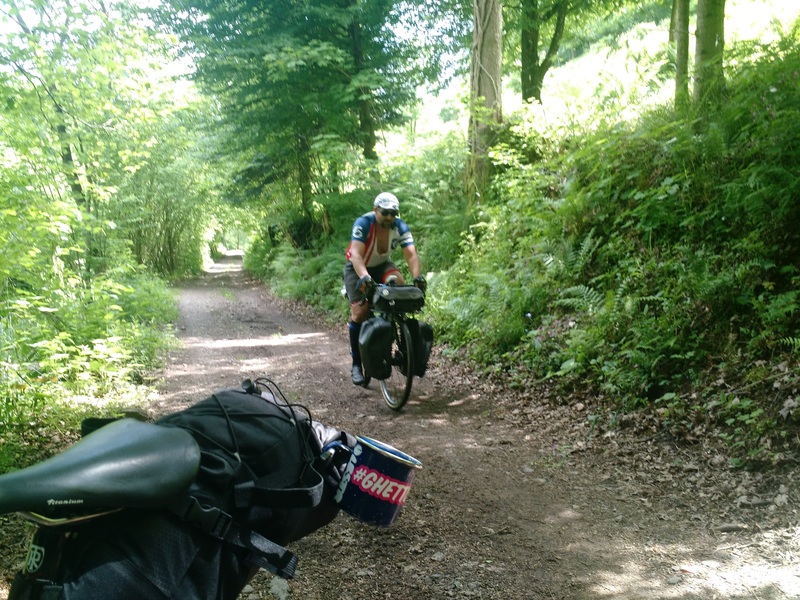 Riding the valley was fun, then started the climb… First, kind of tarmac, then it switched to heavy gravel with of lot of percentage… Neverending. On top of the mount we figured out where to sleep, it took more time till here than we expected… A nearby lake was the planned finish for today! When we arrived at the next villagewere the shops already closed. 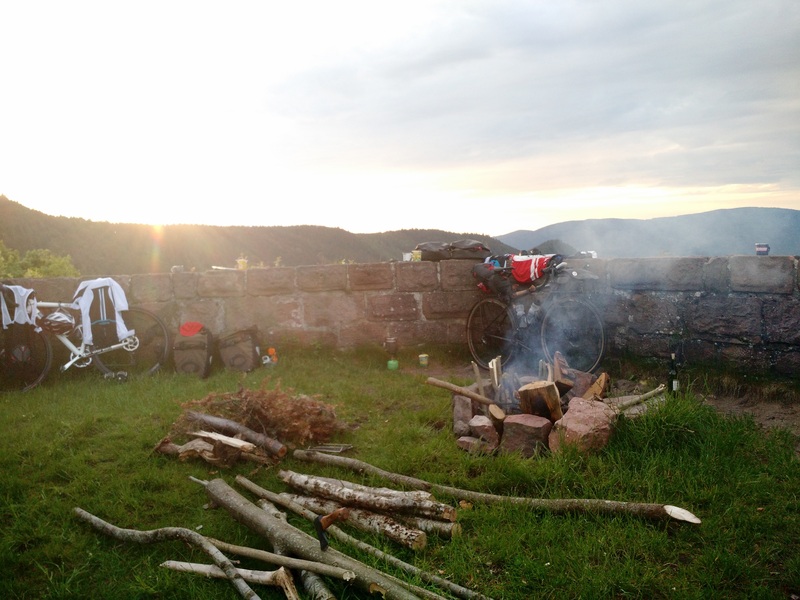 Where to get the beer or wine for the campfire? Damn! 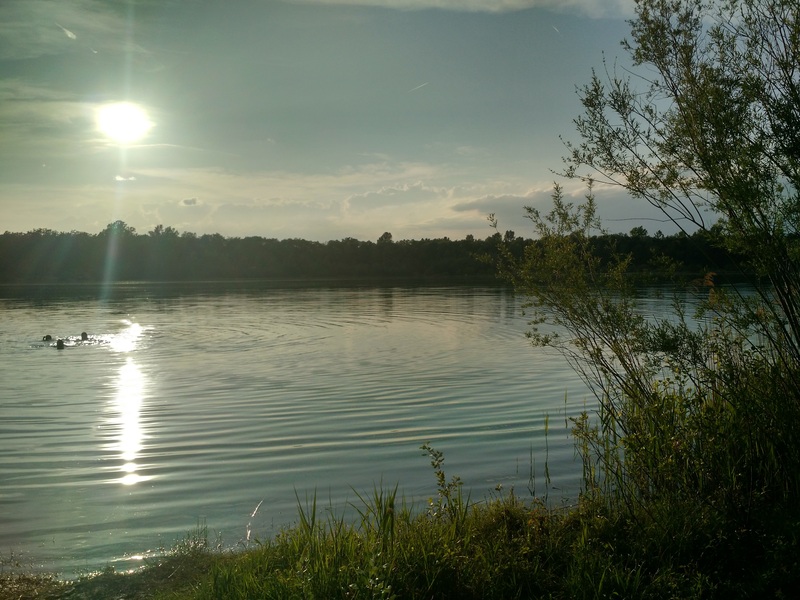 We got back on the bikes and where heading to the campsite at the Lac de Longemes we passed 30 minutesa before to grab some dinner… We took another way, more for hiking to go back and found the perfect cabin in the woods for us. It was perfect, it had a kind of shelter, perfect because the weather forecast called a storm… With good motivation again we were at the restaurant had burgers and some earned beers. Also we were happy to be able buying some drinks for the upcoming campfire. After that we headed back to the cabin and build our night camp. We had some wine and great campfire vibes till the cabin got the honor to keep us save for the night. 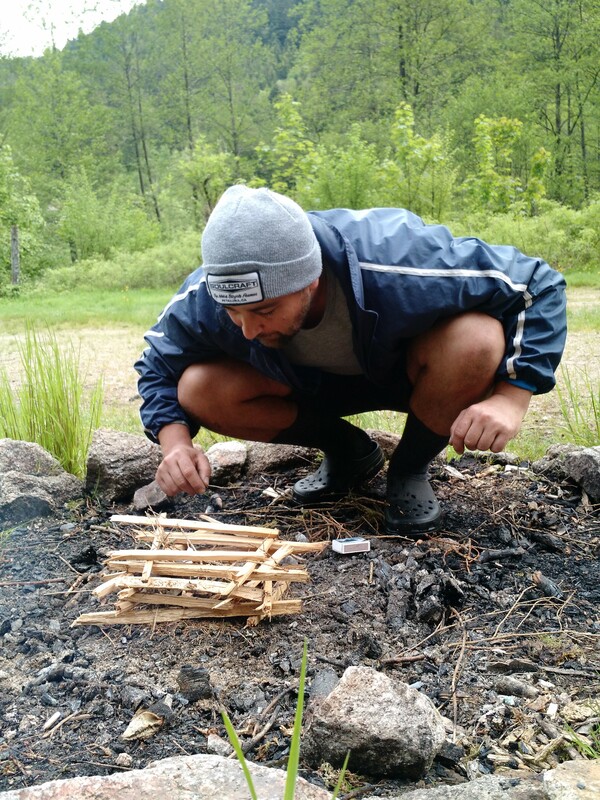 The morning Recep needed some more campfire. Just because he can! 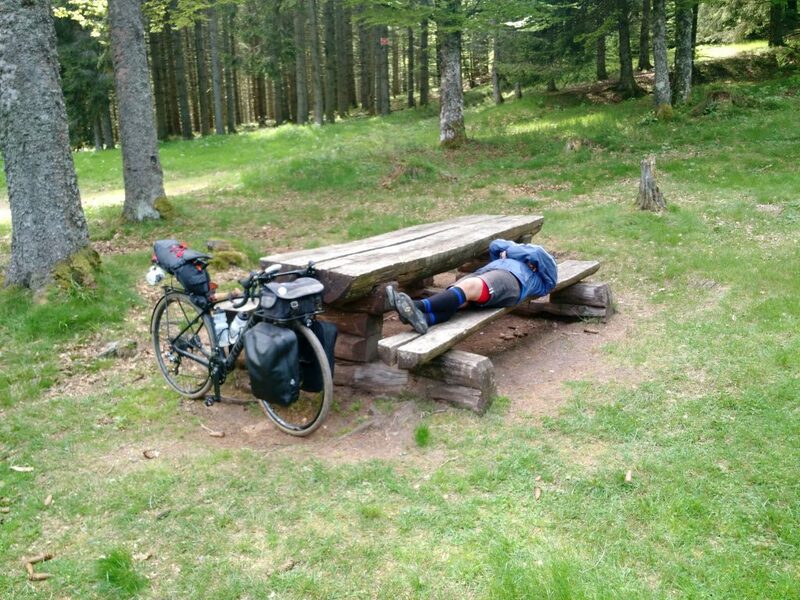 We cleaned everything up before a dude came on his bike with dog and asked us if we slept there… It was the ground of the camp site a few meters away… The dude stayed cool, always clean your spot 🙂 Then the day started with a more than solid uphill. What’s better than a serious uphill on start? A serious uphill and rain! So it lightly started to rain. For our pleasure. On top of that thingy we first had a coooooooooooold coke. 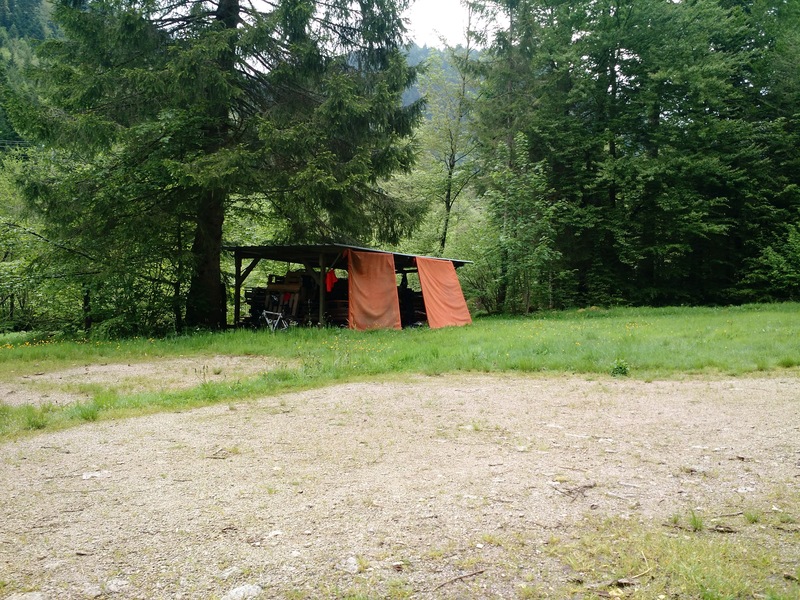 After that we had just a easy ride till ‘Col de la Schlucht’ and then like 12k just downhill… We had luck because the rain just scratched us. The street down was completely wet… When we reached the village on bottom ‘Munster’ (known for the ‘Munster-cheese’) our karma got good enough again and the sun came out. Time for lunch. PIZZA with MUNSTER cheese! Back in the ‘Rhine-canyon’ we were just eating k’s back to the german side of the Rhine. Passing ‘Neuf-Brisach’ which is a special kind of village. Back in germany we figured out a lake as sleeping spot. 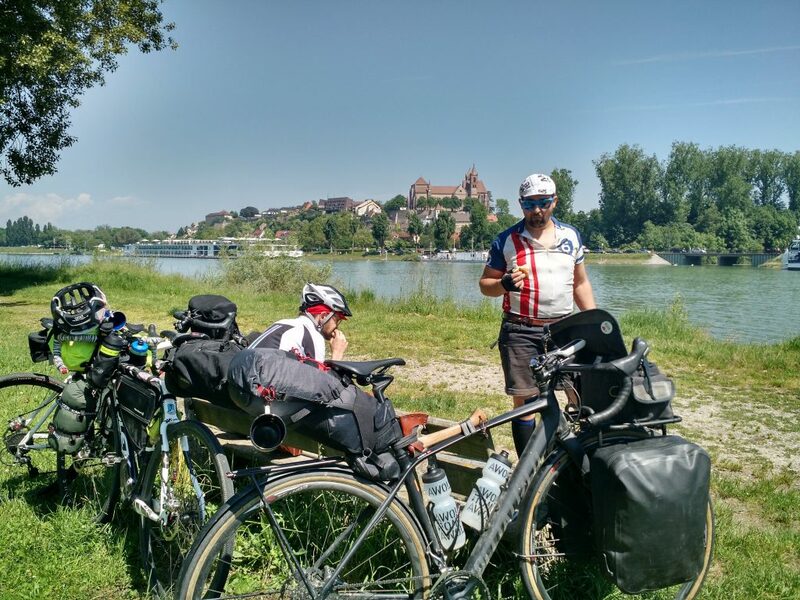 We catched some BBQ stuff and drinks in Breisach and steered direction the lake. Arriving there a couple ‘gave’ us there BBQ-fire because they left. Still good karma! Great dayz with great boyz! Always again!